Picture old women sitting around a porch drinking beer, quilting together, creating something warm and strong, and talking about their lives. We are those old women. Inspired by the quilts of Gee's Bend, this is not a class focused on traditional quilting styles, but an excuse to come together, exercise our artistic creativity and radicalism, make something useful and beautiful, and build love and friendship. 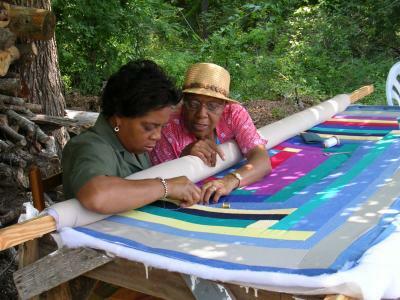 We'll discuss materials, process, design, the political implications of creating something from waste, and how historically quilts have tied communities together through generations of hardship. Though we will be working on individual projects, we will help and influence each other as a community. Requirements: All genders and all skill levels welcome. Please bring sewing stuff, snacks and beer to share.